We host a big Christmas Party every year, and we REALLY wanted to have at least a working toilet and sink on the first floor by then. 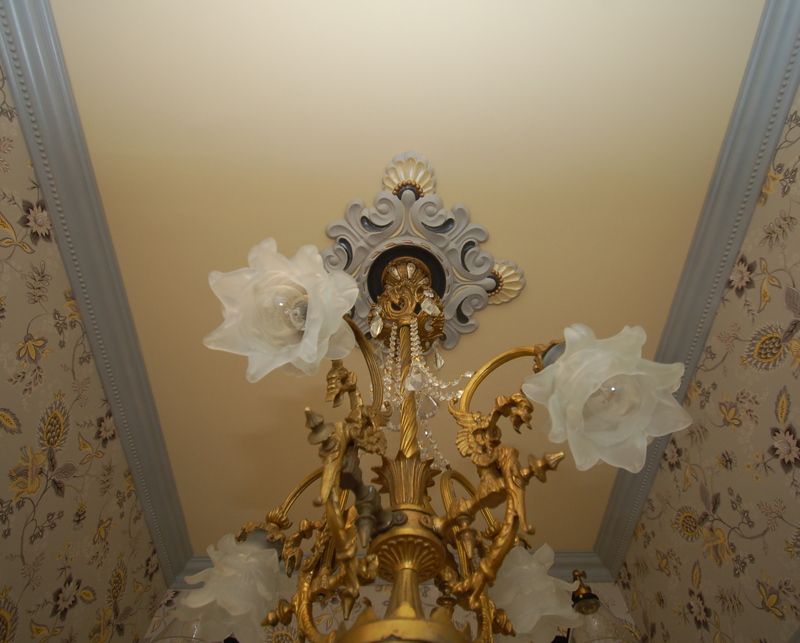 But before that could happen, we had to do some other fancy things – like wallpaper and crown moulding and a chandelier! You’re right. I do need them to be happy, but I don’t need them to be functional. But in this case, the “Pretty” had to come before the practical. That’s why. If we did the practical first, we wouldn’t be able to fit the scaffolding in the room. So, we’d have to wait until after the party, take out the sink and toilet, and then do the scaffolding projects, and the re-install. This seemed like a worse idea than just staying up way too late for many nights in a row to get the tall work done. 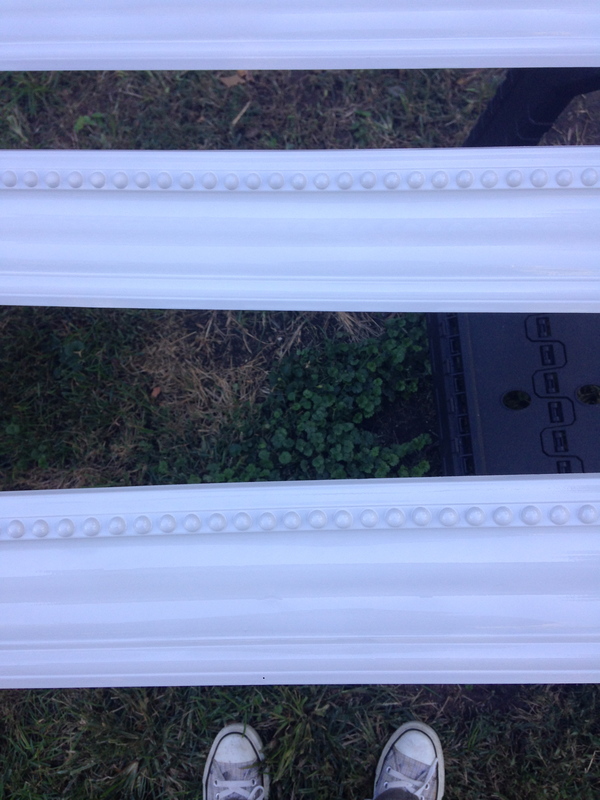 Crown Moulding (from Architectural Depot). Simple, but has texture! 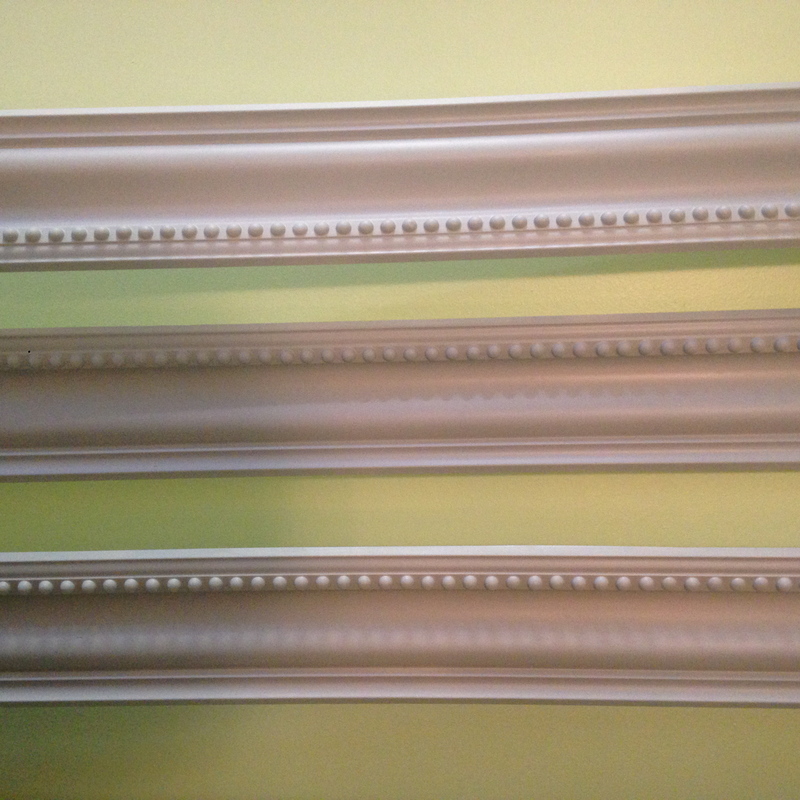 I went gray with the crown and picture rail. 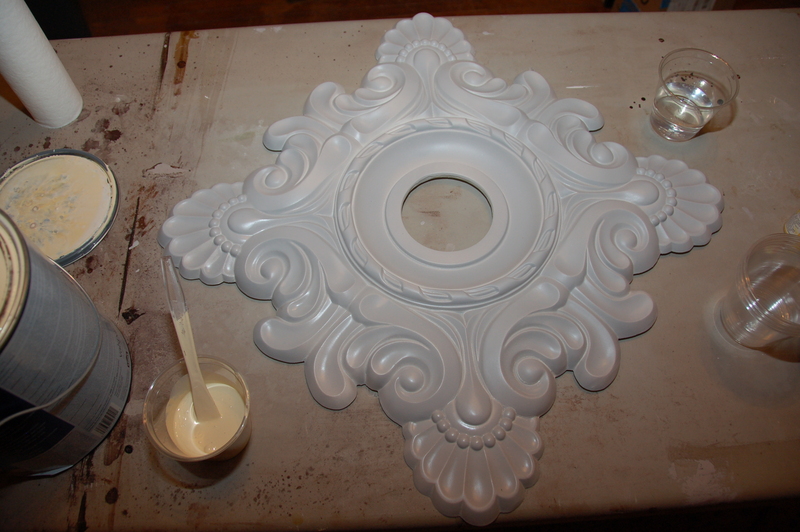 I also started work on the ceiling medallion. Ceiling medallions make me way happier than any inanimate object really should. 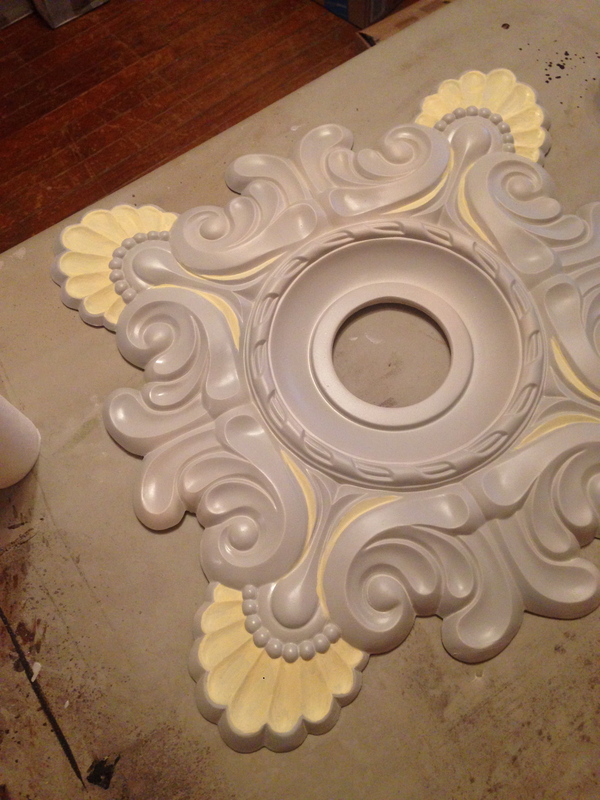 I LOVE making ceilings as special as the walls. First layer is gray! 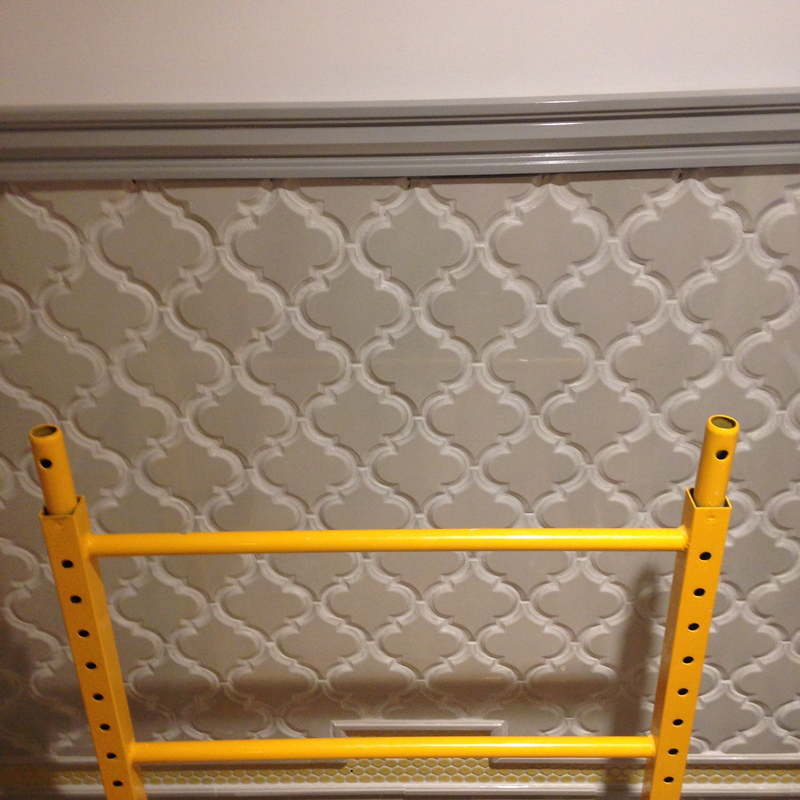 The second layer was yellow – a mild buttery color, that I put just a touch of bright yellow craft paint in so it’s SLIGHTLY more bold than the walls and ceilings will be. 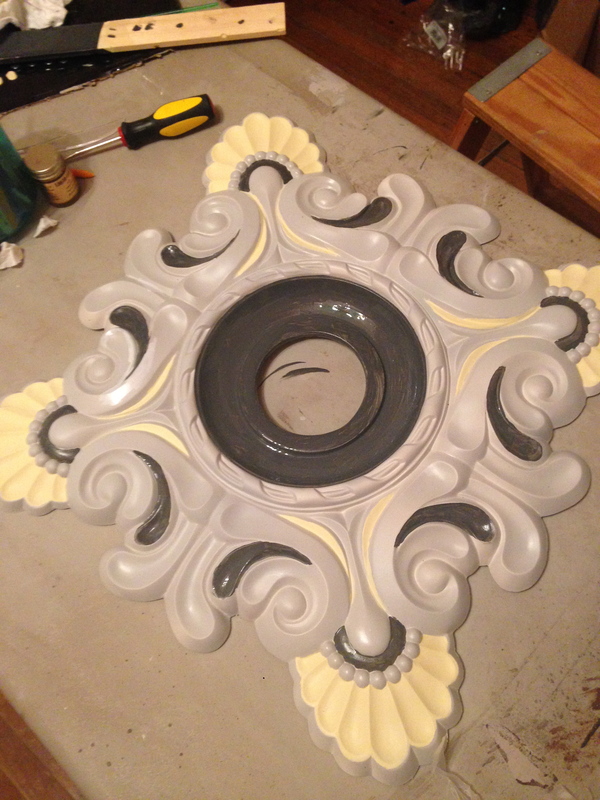 Layer three is the dark gray that I painted the clawfoot tub that will be in the room. 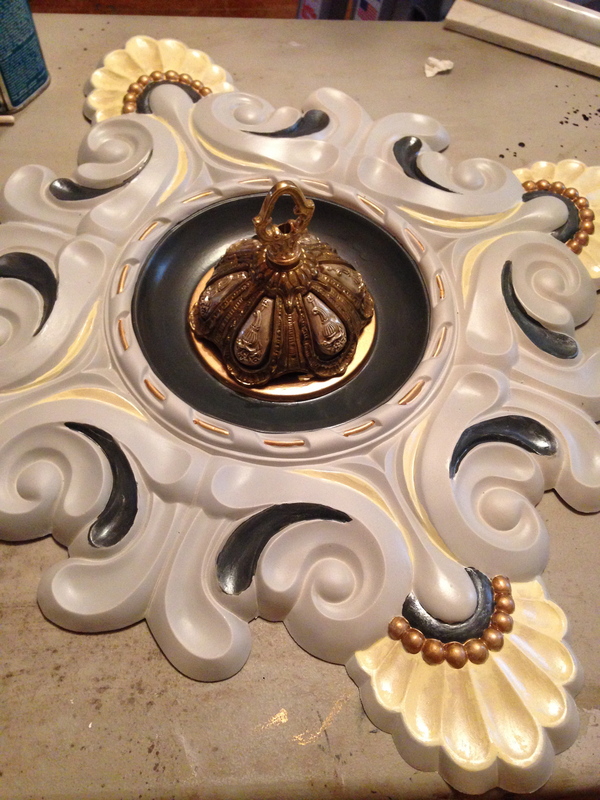 Layer four is a little gold-leaf paint, to highlight the brass fixtures that will be in room, and this AMAZING canopy I found on Etsy. 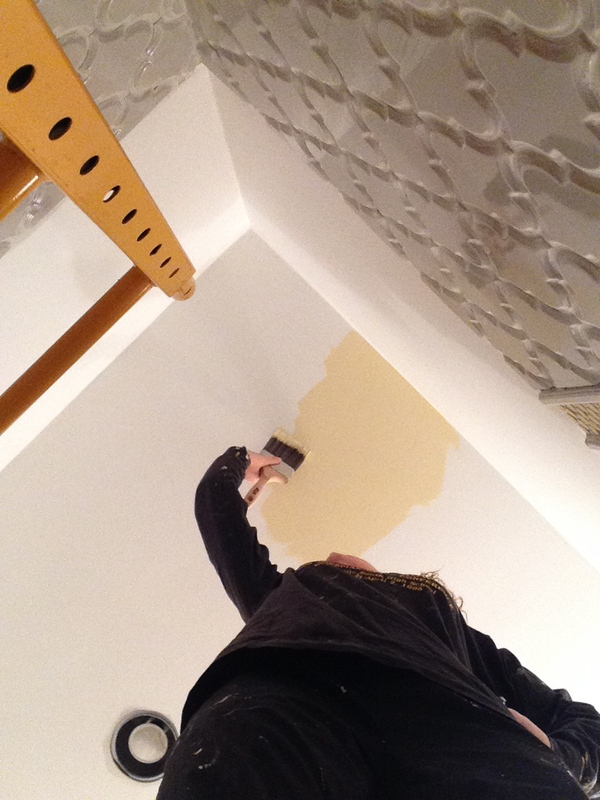 I painted the ceiling! Doug was impressed with my selfie-taking skills with this picture. Thank you, iPhone timer! I’m glad I took this, because I think every picture from here on out doesn’t have me in it, which might make you think I didn’t do any work but I DID I PROMISE. 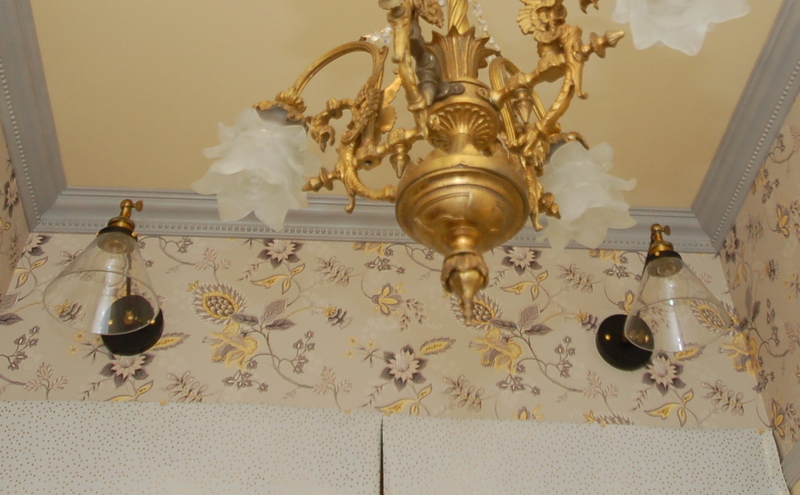 I guess technically the wallpaper is on the four walls, and not the fifth, but I’m counting it as part of the ceiling because it really is just an extension. Can we talk for a moment about how much I LOVE this paper? Yellow and gray flowers. Ancient. It just seemed RIGHT to put flowers back in. And I found this paper, and it was perfection. 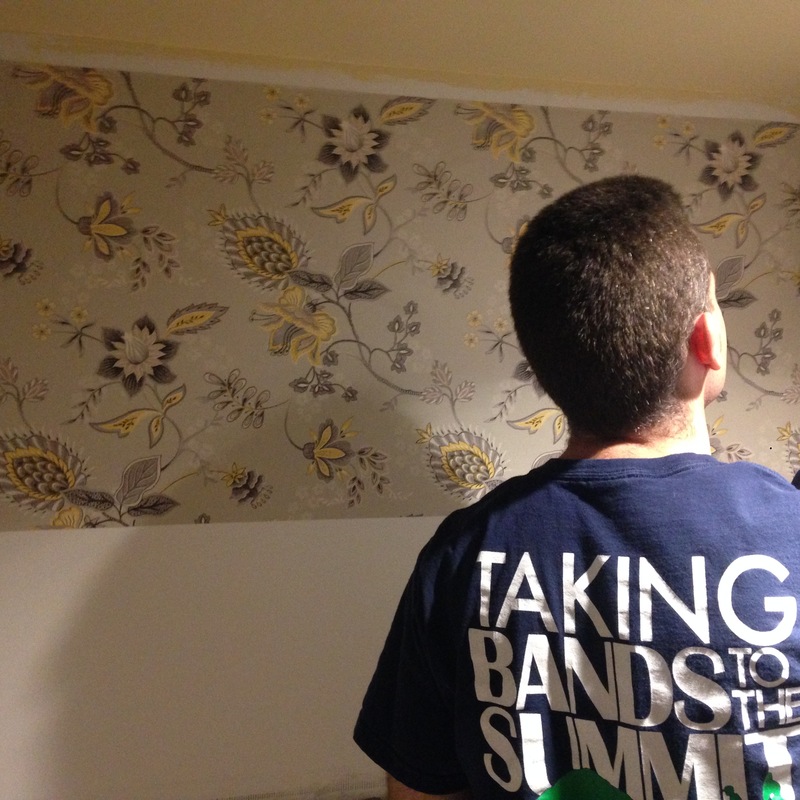 It’s not a wallpaper border, but we’re treating it as such. When your ceilings are 11 feet tall, it can take a wide border. So we used a regular wallpaper, and just turned it on its side! Four pieces, one for each wall. It took less than one roll for the space. 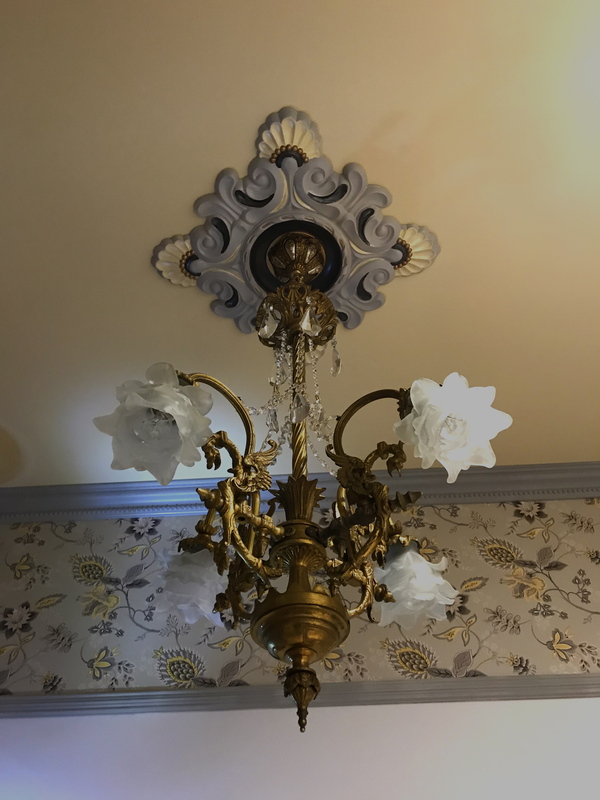 After the wallpaper, we hung up some mouldings – none are wood, they’re all urethane, but after painting I treated them with marine varnish anyway – water or steam can’t get at them. We added a cap at the top of the shower, a crown, and a “picture rail,” which isn’t REAL picture rail but it looks like it. 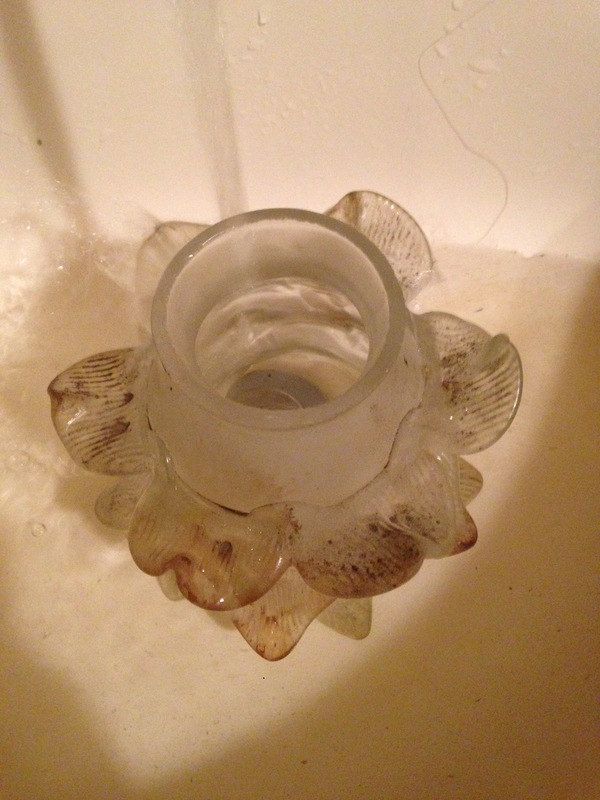 Here’s the start of the cap to the shower. 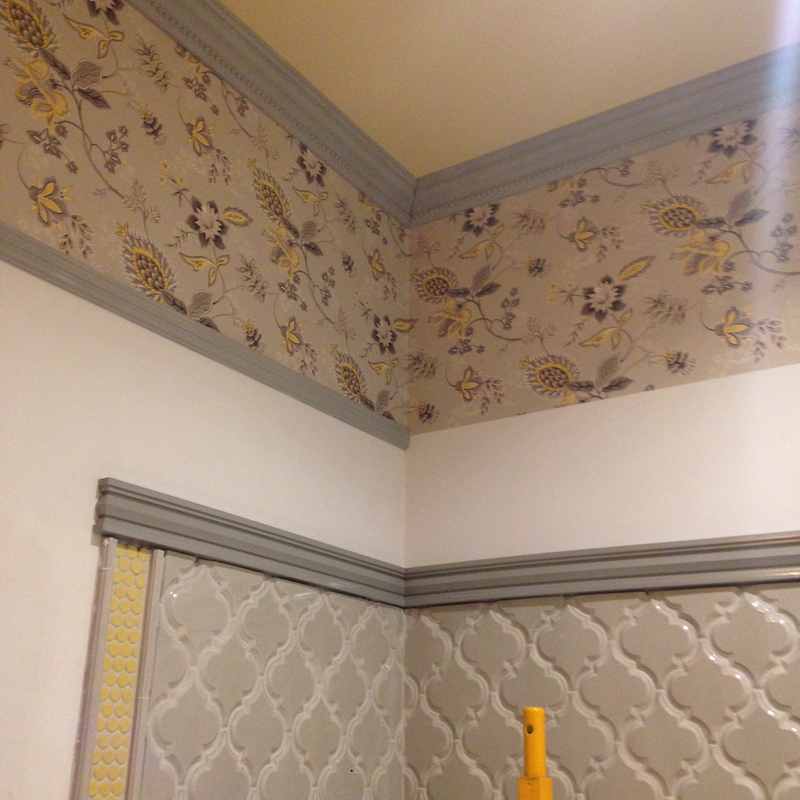 Using the wallpaper on the side gave us only 4 seams, and then the edges are held down with the mouldings, so this paper should be very secure in a bathroom (by design). 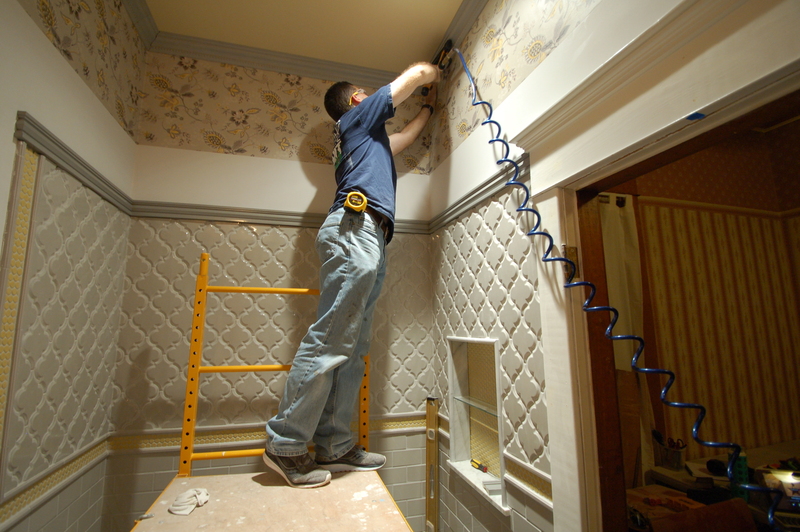 I didn’t have any hesitation about using wallpaper in a bathroom – this won’t be a primary shower, except when we might be restoring other rooms, so it won’t have steam or heat every day. I might have thought twice if it was a primary space (but let’s be real, I might have done it, anyway). I PROMISE, I did work, too. But seriously, we were working so fast, that I’m amazed I have this many pictures. We never stopped. 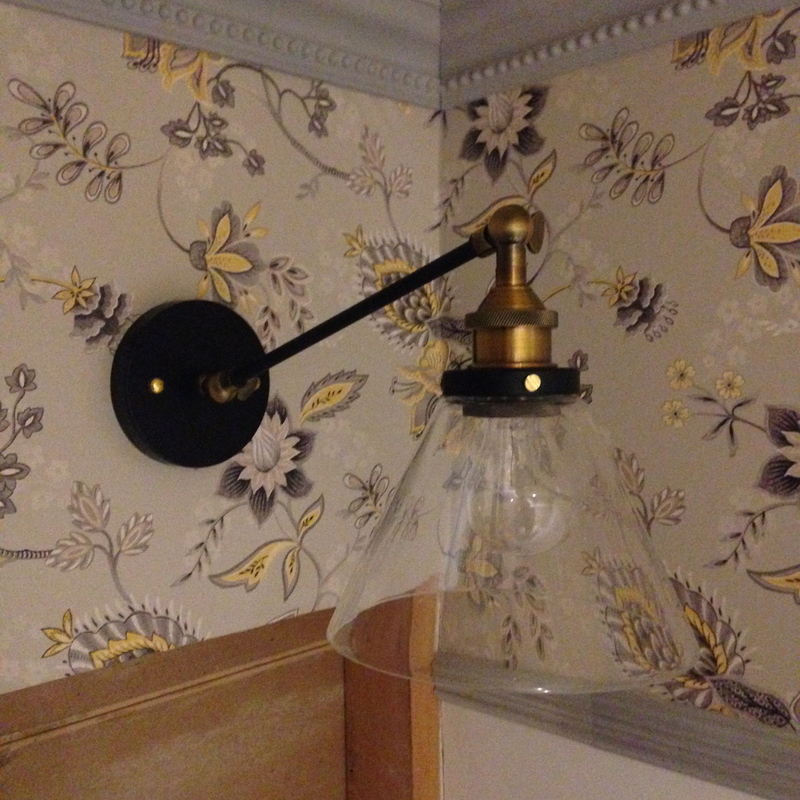 This picture is super grainy, but also going up are a simple pair of sconces to go over the future apothecary cabinet! I wasn’t lying when I said there was NO time for picture with the real camera when things were happening! A couple of years ago, I saw a post on Craigslist about an antique lighting store / warehouse in Chicago that had a retiring owner who had 5 floors of lighting from Europe and America, and was liquidating everything. Intrigued, I sent my friend Jason, who is stationed in Chicago, to see if it was worth going to. He went, and facetimed me to show me what was there, and we rented a trailer and went. We came home with a TON of goodies to restore for the Madison Street Salvage – many were just shells, and almost everything needed a full restoration. A few pieces I knew I wouldn’t be able to part with because they were just perfection. And look what these belong to!!!!!!!!!! Yes. Those are DRAGONS. IN MY BATHROOM. I have zero idea how old this might be, or who it might be made by. Ross? Any thoughts? With the sconces (and Christmas Wrapping Paper covering the medicine cabinet hole because I keep my Christmas parties CLASSY, y’all). 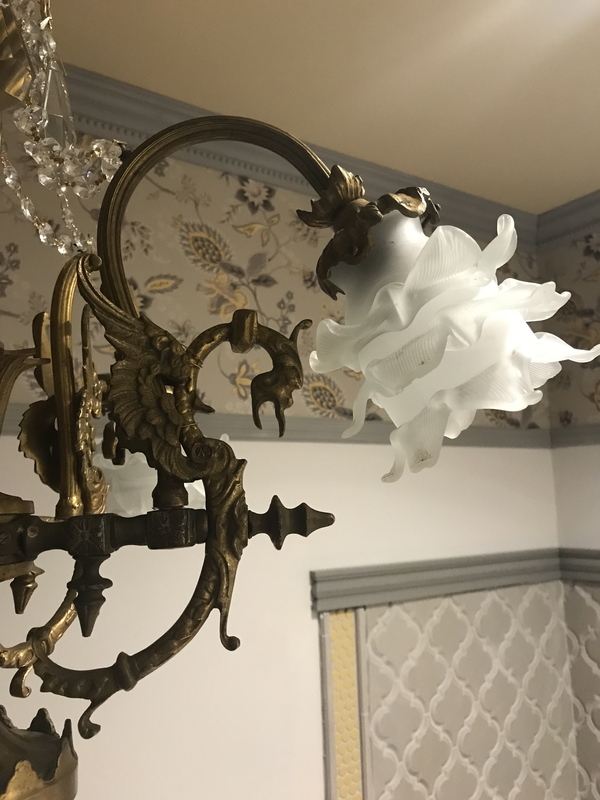 The suggestion has been made to put a little brass engraved plate on the door, stating, “Here Be Dragons.” I’m on board with that, or an elaborate cross-stitch piece that tells all visitors they must notice the dragons in the chandelier because WHAT IF THEY DON’T SEE THEM. Surely, someone has an Etsy shop to fufill my needs. 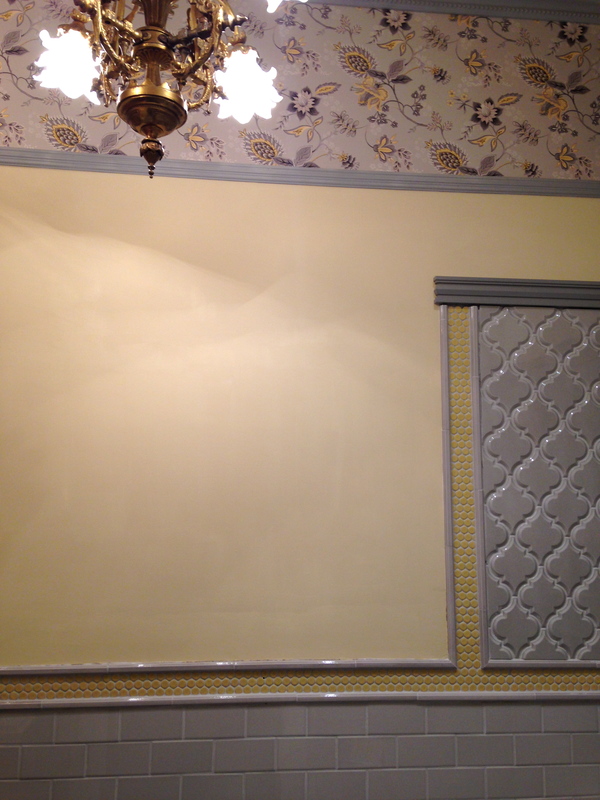 Oh, and I also painted the walls yellow. I’m so excited about this room. Oh my gosh!! This is AMAZING. Everything is just beautiful and done to perfection. You guys should think about giving up your day jobs, and go on HGTV. Thanks for sharing. Have a wonderful Christmas party. 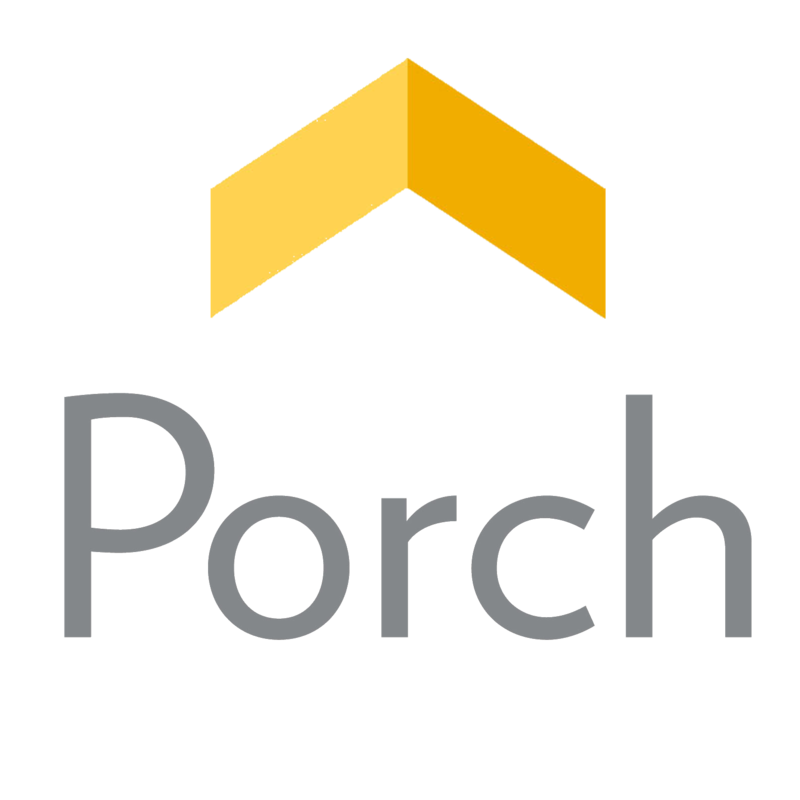 Funny story about that – we’ve actually had 4 production companies who work with HGTV find my blog and ask to talk to us about what we do – and once they find out we’re only doing ONE house, they aren’t that excited about us. If it isn’t a whole house in 30 minutes, it doesn’t seem to have a market! I think a show with a focus on details would be SO fun (even if it’s not us!). It really is such a lovely combination! The dragons are beautiful! It’s coming along so well. 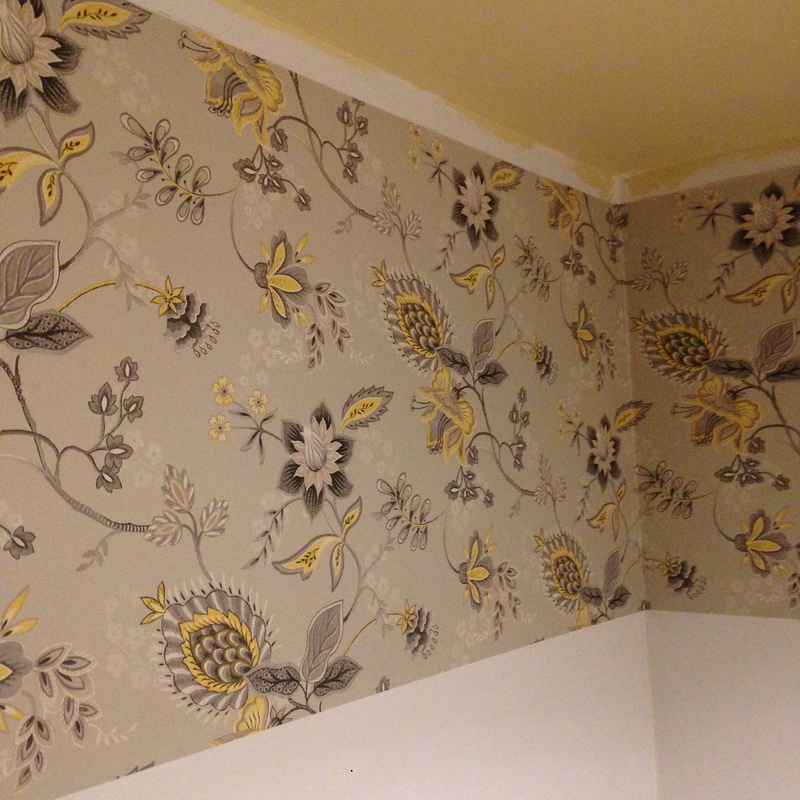 My mother has wallpapered every bathroom she ever had, and never had a problem with the paper – even with long hot showers. This will be fine! Please tell me you didn’t paint the entire ceiling with a brush! Your mother gives me hope! And yes, I TOTALLY did! I almost always do ceilings with brushes, even large ones. I hate paint splatter from rollers and I feel more in control. 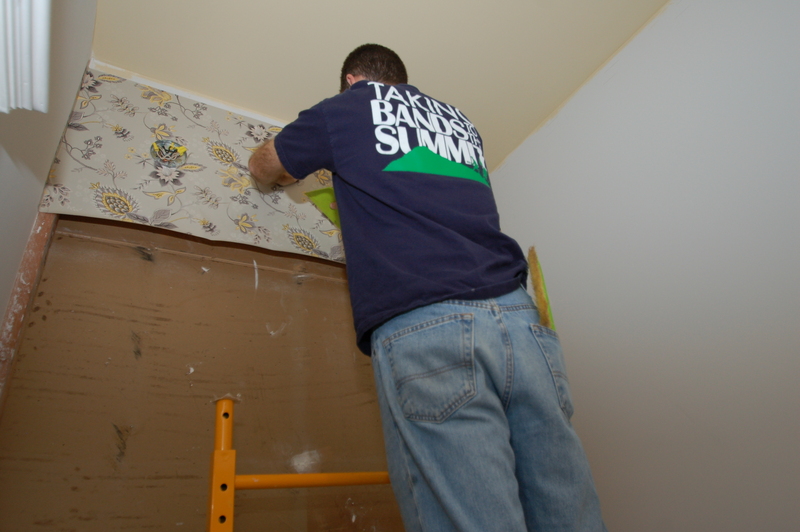 This room took about an hour with a 4″ brush. When I did the big bedroom upstairs, I did it in small shifts over several days to keep my arm form falling off. It’s really not that bad with the scaffolding! Goodness, Amy…my jaw dropped more with every photo. Fantastic. The dragons are icing on the cake. I am stunned. Your taste is exquisite. Thank you so much, Anne! I’m so glad you like it! Magnificent!! The dragons and the shades are stunning!!! I’m so excited about them, too! I am so jealous of the dragon light. I love dragons. Your bathroom is stunning. Enjoy your Xmas party. Wow, it’s so beautiful! That chandelier is amazing. 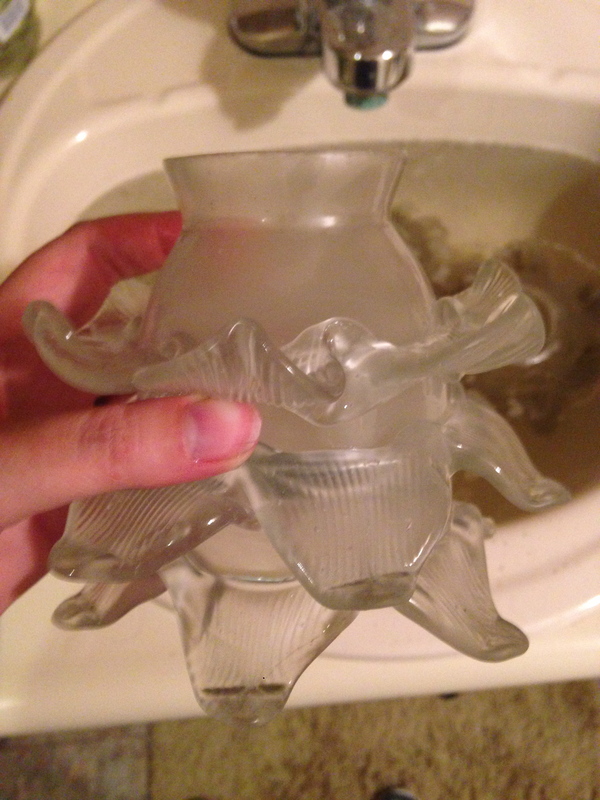 And why wouldn’t you have dragons in the bathroom? They go so well with the monkeys in the laundry room. 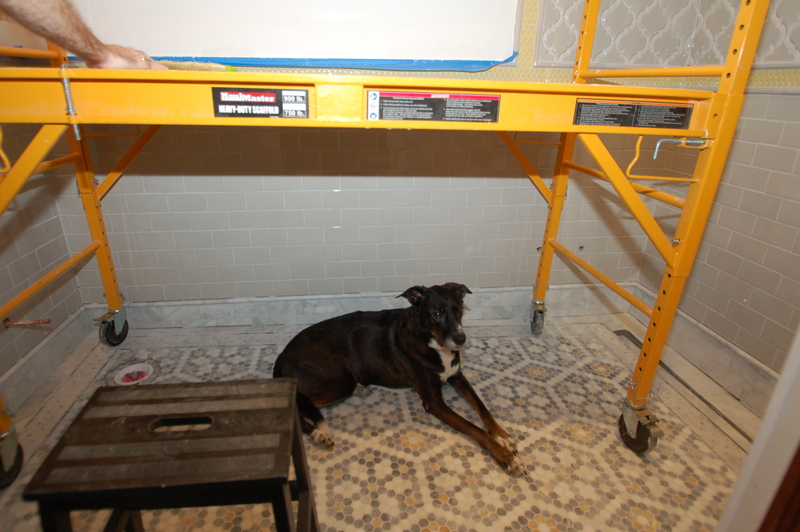 Maybe every room needs its own mascot? Oh this is soooo beautiful! Thank you so much! Next is going to be getting the basement organized into a decent workshop and getting an outbuilding / shed – but the next finished space (I THINK) will be the library! I LOVE it! It’s GORGEOUS! 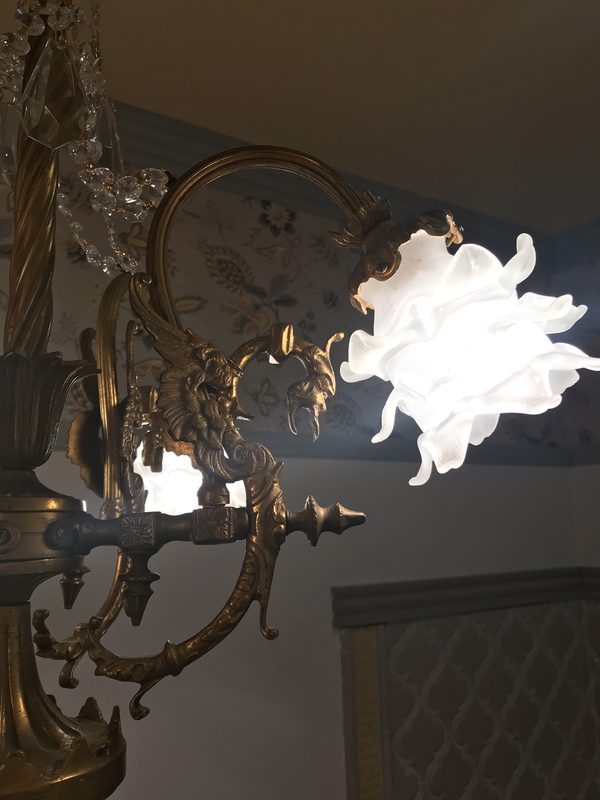 The chandelier is exquisite, I adore dragons! 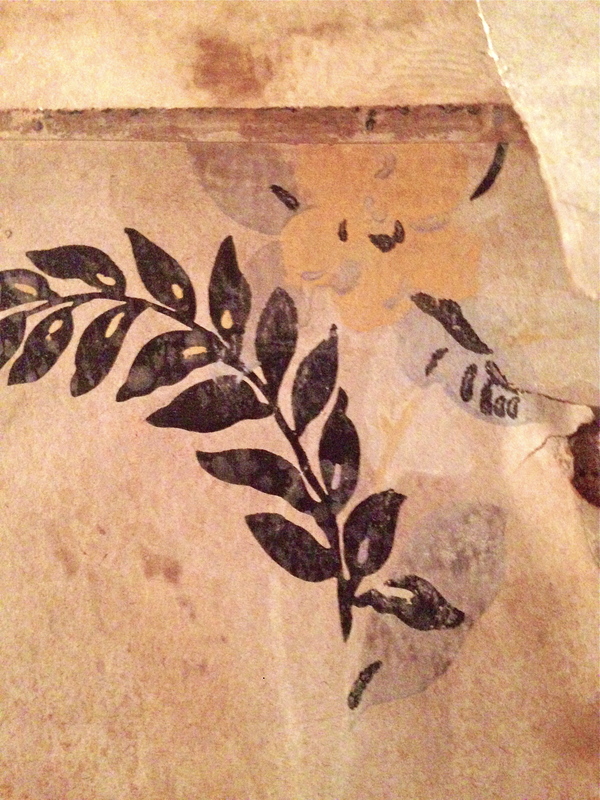 The wallpaper and medallion are wonderful also. I’m so excited for you! Your attention to detail is phenomenal! I would watch your HGTV show on paying attention to the details and the time involved! Real life and real time! Sooooo inspirational!! THat’s a wonderful compliment! I appreciate it so much! 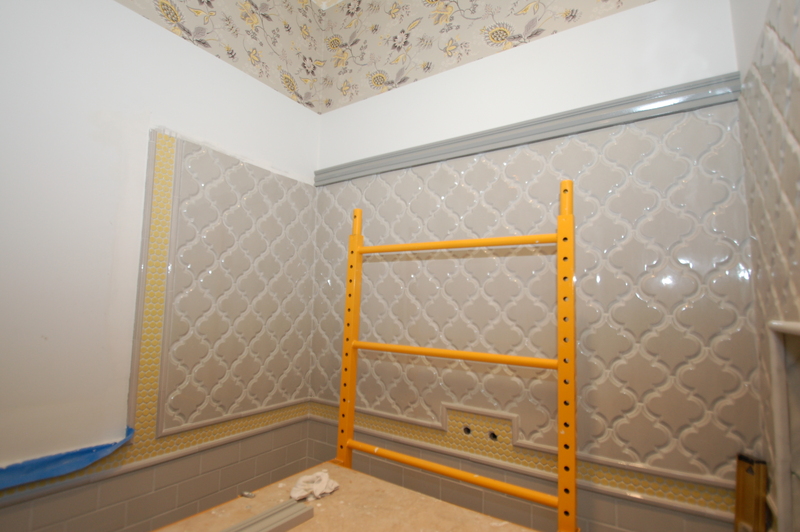 What a gorgeous bathroom — I recently had my bathrooms wallpapered after 15 years. The man had to grind the old paper off before hanging the new stuff and it cost a small fortune! But now both bathrooms are gorgeous (and clean) again. Wish I had seen your blog beforehand though. 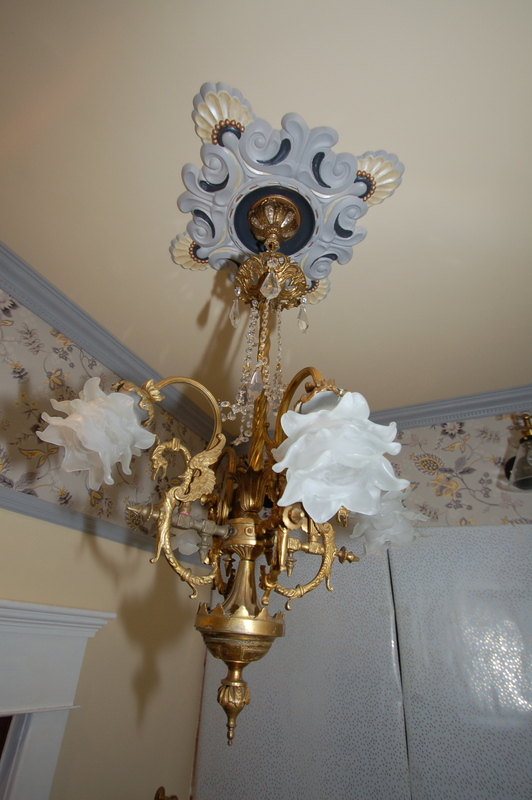 Chandeliers in the bathroom rock! Thanks, Connie! It sounds like you put a ton of work into yours, as well! I’d love to see sometime!